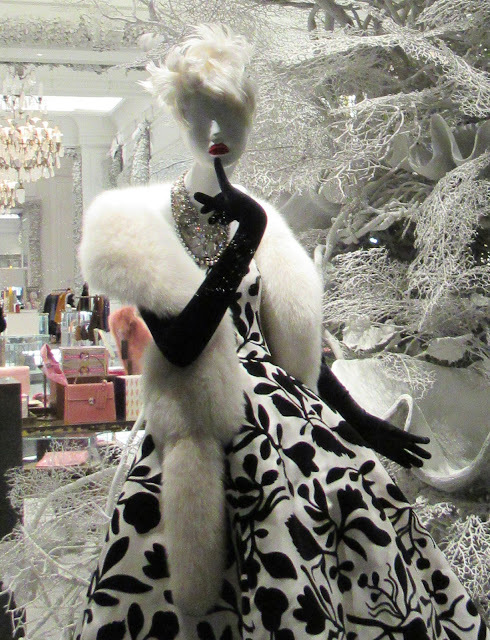 Instead of my usual Bergdorf Goodman holiday window roundup, where I post every window display, like in 2016, I thought I’d go straight to the good stuff—my favorites! 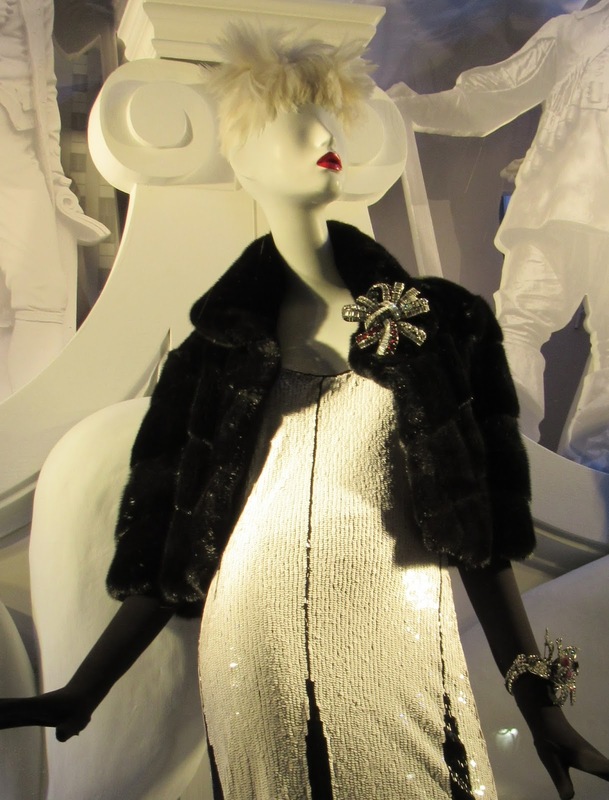 This year’s theme is Bergdorf’s ode to New York City, highlighting some of the cultural institutions that make the city famous, such as the Museum of the Moving Image (in Queens), the New York Botanical Garden (in the Bronx), and the New York Philharmonic. I loved the window that was a tribute to the American Museum of Natural History since it featured glittery dinosaur fossils and a mannequin in a silvery dress, but most of my favorite looks were actually on the 58th Street side of the store, across from the Plaza Hotel. I went on the night the windows premiered in November and had the place to myself, which is always a treat. BG’s ode to the American Museum of Natural History. I approve! Who can resist sequins, feathers, and fur (hopefully faux, but it is BG). It seemed to me that while the backgrounds were tributes to the city—the Empire State Building, the Chrysler Building, Grand Central Terminal, the founding fathers (a tribute to the Broadway hit “Hamilton” I am sure)—the clothes were tributes to the socialites of yore! I have been reading Truman Capote lately and have Babe Paley on my mind because of it, so I can’t help but see a bit of Babe and the other society “Swans” Truman so loved to pal around with when I see these clothes. A brooch as big as a corsage! So many NYC symbols contained in one display! I never get tired of black and white. 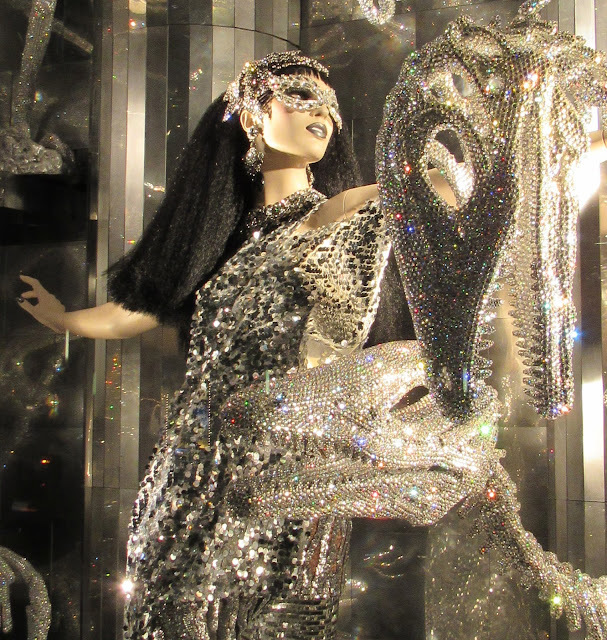 Easily my favorite Bergdorf Goodman window this year. I have really been loving black and white so much in 2017 so I’m not surprised that I was drawn to these looks. 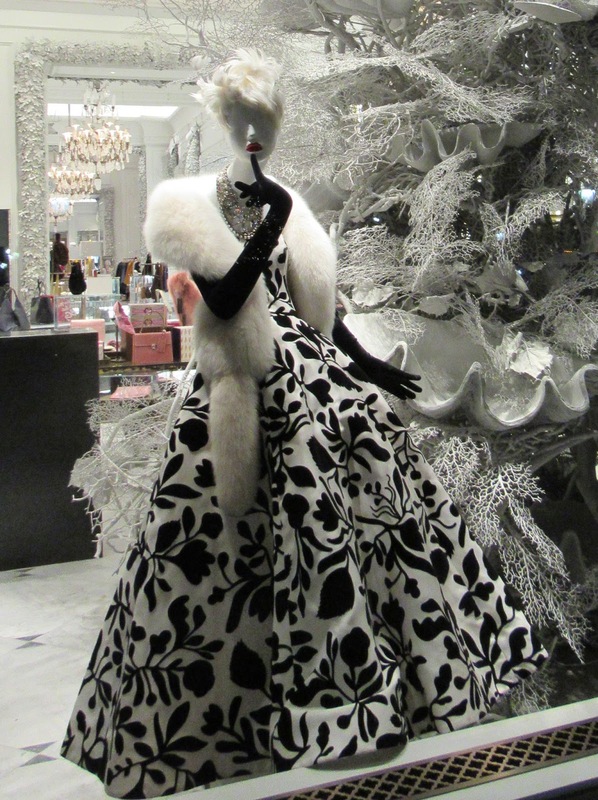 I loved loved loved the black and white floral gown with a fur wrap, gigantic crystal necklace, and black gloves. This absolutely seems so Babe Paley to me! Love the details of this look! If you get a chance to see the windows, I always recommend going at night so you can appreciate the colors and the intricate details. I hope for your sake you do not run into the crowds I have seen out in front of Rockefeller Center and Saks Fifth Avenue lately, the worst I have ever seen them! Let me know if you have a favorite among these gowns. I hope you are having a fun holiday season! I did get to see the BG windows. It was during the day & it was very crowded, so I didn't get optimum viewing. What I did get to see was just glorious. I love BG's theme this year paying homage to the New York City icons. Particularly, the Museum of Natural History. Yes, the black & white display was reminiscent of Truman Capote's "Swans". The "Swans" in my opinion was led by Babe Paley until she was replaced by the younger Lee Radziwell. I noticed that Capote's "Swans" were for the most part, tall, brunette, beautiful, definitely slim & definitely rich. Sadly Capote blew up his friendships by publishing his thinly disguised tell-all book "Le Cote Basque". Foolish & petty. Forgot to add another book by Capote where he betrayed his close friendships with the "Swans" & others. It's "Answered Prayers" a novel, but not really. I absolutely love the black and white formal looks----my wedding colors were black and white (and silver). So perfect for formal dressing!